I have been reading Feral by George Monbiot. He wants to rewild the planet: the seas, the skies, the land and the animals. His approach is global but he focusses on Britain. One part of the project is to reintroduce megafauna. Is it possible? Is it even a good idea? Here in the French Pyrenees and neighbouring departments there are still some thriving megafauna, others are threatened or have recently disappeared; some animals have been successfully reintroduced. So what does all this have to say about rewilding? 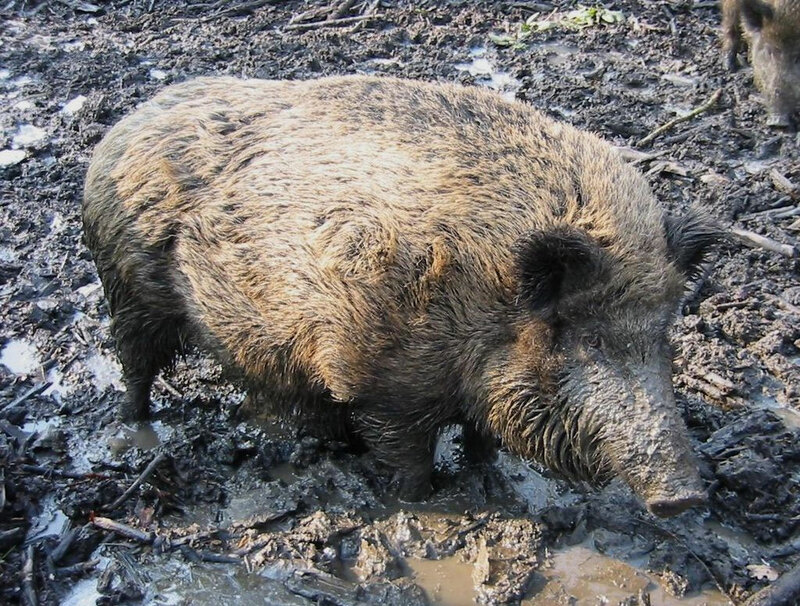 Wild boar score 10 (out of 10) on Monbiot’s scale of suitability for reintroduction, a combination of ecological interest and likely acceptance. In the department of the Aude where I have lived for the past 20 years, there are an estimated 30,000, and over 10,000 are killed every year. Yet, despite their numbers, and many sightings of footprints, I have never seen one in the wild: an unmistakably piggy snort followed by a lot of rustling in the undergrowth is as close as I have been. But they are dangerous. A few years ago an old woman walking in a vineyard in a neighbouring village was killed by a wild boar; I know somebody whose car was written off when a boar charged out of the forest in front of her; and there are deaths every year as a result of hunting accidents – but nobody is calling for their extermination. The only complaints come when they destroy crops (the damage is compensated by the hunting associations). The main problem is overpopulation: wild boar have mated with escaped domestic pigs and instead of producing one or two marcassins the average litter is now six. As a result, the boar are less and less ‘wild’. Monbiot scores the lynx as 9. It disappeared from France in the 1930s but was reintroduced in the east in the 1970s and is thriving in the Vosges, the Alps and the Jura. There are claims that the lynx never disappeared in the Pyrenees. Wolves score 7 on Monbiot’s scale. There are officially two male wolves living in the Madres and Carlit massifs at the eastern end of the chain. It seems that they have made their own way without any help all the way across southern France from Italy. After an attack in May 2014 which killed fourteen sheep near Fanjeaux (Aude), Serge Vialette the president of the local farmers’ union claimed to have been told there were 100 wolves in the Aude and Pyrénées-Orientales. Shortly afterwards he went even further, adding vultures, bears and “doves stuffing themselves on sunflower seeds” to the list of problems faced by farmers. Yves Bastié, president of the Aude Hunters’ Federation, went on to incriminate weasels, martens and polecats. (Independent, Narbonne edition, 17 May 2014, p 18). The farming community is becoming increasingly alarmed. The prefect has authorised shooting in case of a new attack. Bears score 3 out of 10 on Monbiot’s scale of acceptability. Not in Ariège. The presence of bears in the Pyrenees is the local controversy. At present there are 30, maybe a couple more. 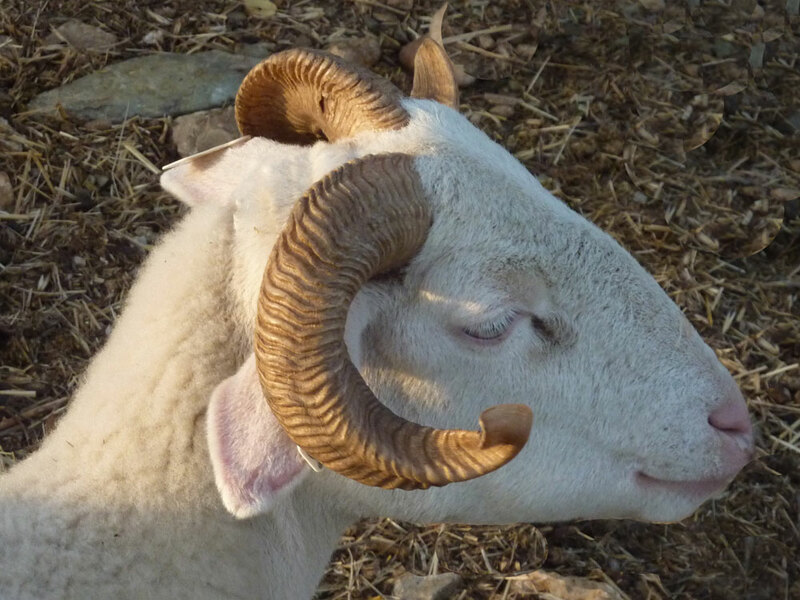 So it is unsurprising that I have never seen one, but even Francis Chevillon (Esbintz, Ariège) who spent every summer for thirty years with his sheep on the flanks of the Valier has never seen one. Paw prints near the spring, yes, but never lo Moussu himself. There were perhaps 3000 in the Middle Ages. Where their presence conflicted with human activity they were persecuted, taking refuge in the Pyrenees. There were something like 150 at the beginning of the 20th century; by 1995 there were only five before the reintroductions of 1996, 1997 and 2006 (six females and two males). Nobody has been killed by a bear for over 150 years but these are not the teddy bears of our collective subconscious: they kill between 150 and 350 sheep annually. This can be compared with the 20,000 or so losses due to other causes amongst the 590,000 sheep in the Pyrenees. However, the attacks are concentrated in a relatively small area of the High Ariège and affect certain communities disproportionately. There is much anger in the Ariège at what some locals see as a policy imposed by townies who don’t have to live with the consequences. (I also know sheep farmers in the affected area who regard the bears as part of the heritage of the mountains, but the dissenting voices predominate in the media.) The opponents point out that the brown bear is not in danger of extinction globally. And now that the genetic isolate has been destroyed by the reintroductions there is a decreasing biological difference between the Pyrenean bears and their cousins. Bears are seen as an avoidable nuisance in an area where sheep farming is only marginally viable. Even though there are relatively few bears for the moment, every spring when the first attacks are reported the atmosphere becomes tense; the demoiselles may make an appearance. But if the Pyrenean bear population is to be viable, more will have to be imported to avoid the dangers of consanguinity (at least nine of the 30 bears share the same mother, Hvala! Most of the youngsters have the same father, the dominant male, Pyros). 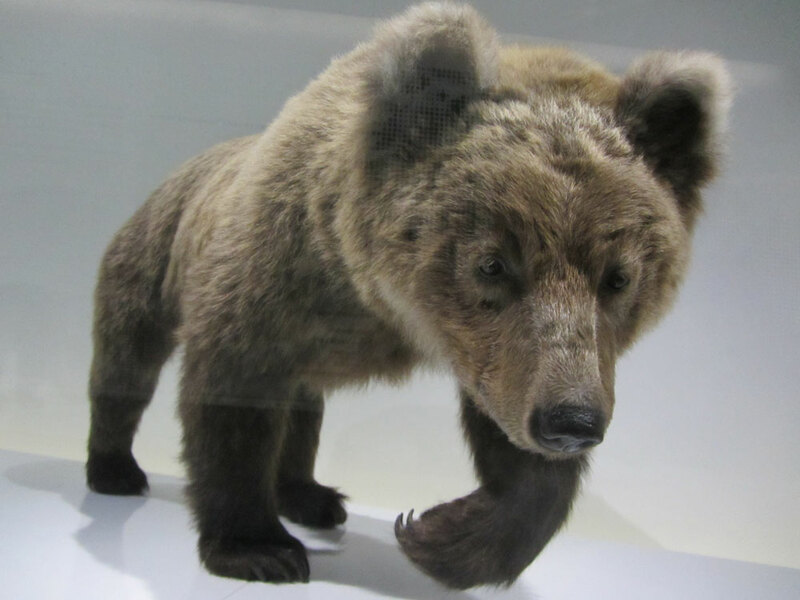 However, since the demonstrations which followed the arrival of the last Slovenian bears in 2006, no government has dared take up the challenge. Indeed, in 2012 the then president Nicolas Sarkozy said that the reintroductions should never have taken place. Paradoxically, his wife Carla Bruni is the godmother of Hvala. If the presidential household can’t manage a united front in public, how can more reintroductions be consensual? So what is the future? The question appears to resolve into a choice: sheep or bears? 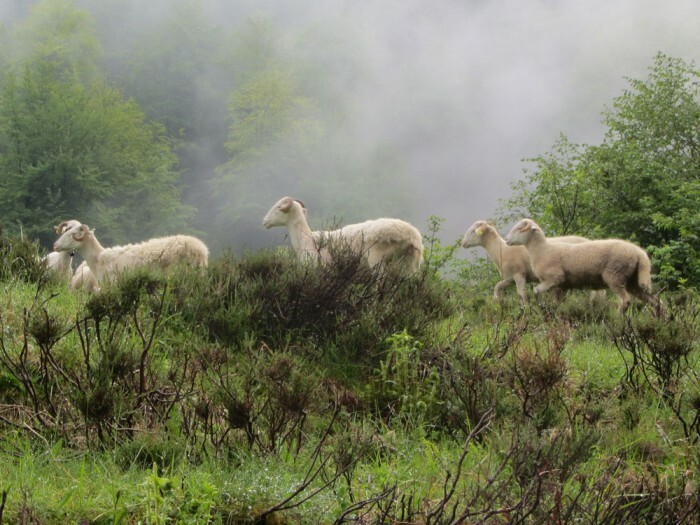 The number of sheep farmers in the Ariège decreased by 15% from 2000-2010 and the number of sheep by about 18%. This trend is not a result of the bear attacks; it is more a question of economics and the difficulty of life as a shepherd in an isolated mountain hut compared with life on the plain. The trend is likely to continue with the more difficult estives in the high mountains being abandoned. There will be an unintentional rewilding. Whether there will be any bears to benefit from it is another matter. The latest news is that French government’s lack of enthusiasm may be irrelevant. The fearless Catalans have announced that they are going to import another male. The deadline was May 2016, though at the time of writing (6 June) there is still no sign of him. The idea is to ‘replace’ Pyros by another male. Although he is 28 years old, a grand age for a bear, Pyros is still the preferred mate for the females. For many years the other males didn’t have a chance, though in the last two years their luck has (occasionally) been in. Things have been quiet since 2012 but the main local anti-bear organisation, ASPAP, is gearing up for a summer of confrontation, starting with a anti-rewilding demonstration in Toulouse on Friday 1 July. They are bussing in supporters from Ariège to protest outside the Regional Préfecture where the meeting of the Comité du Massif will take place. This is not just a sad tale: it is a tragedy. The inoffensive vegetarian Pyrenean bouquetin is extinct. Since 2014 a programme of reintroductions has brought some 80 ibex from further south to the mountains, but the genetic isolate is dead. At the beginning of the 20th century the few remaining Pyrenean ibex were holed up in the Ordesa National Park in Spain. In 1940 the decision was taken not to intervene although the population was decreasing. In 1986 they were included on the Red List of endangered species. In 1993 the Aragon government decided it really was time to intervene. By 2000 the last one, baptised Laña, was dead. She is now in a glass case in an exhibition in Torla (Aragon), looking remarkably perky. A curious postscript to this timeline. 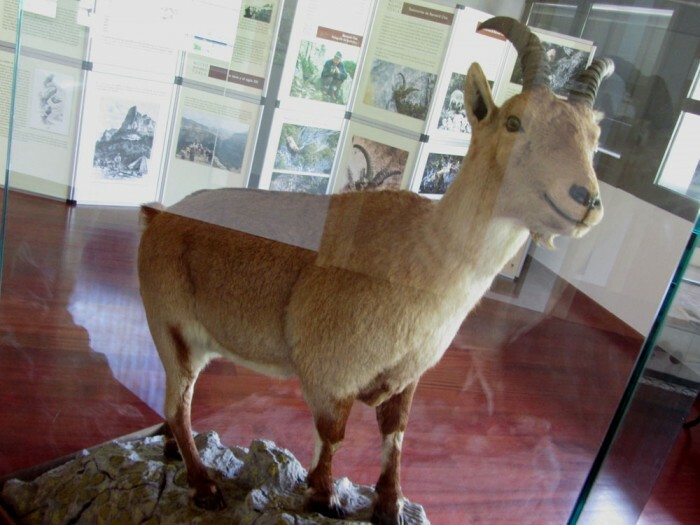 Despite the death of Laña in 2000, another Pyrenean ibex was born in 2009, cloned from her cells. She only survived a few minutes because she couldn’t breathe properly. For the moment the newcomers, released in the Cirque de Cagateille (Ariège) and at the Pont d’Espagne near Cauterets are doing fine, though only two kids were born in 2015, a surprisingly small figure. Not on Monbiot’s list, griffon vultures are common throughout Spain but they nearly disappeared from France. In the 1960s there were only 60 couples living here, essentially in the Pyrenees. They were encouraged to return en masse by the provision of carcasses to replace their traditional food: dead wild animals. 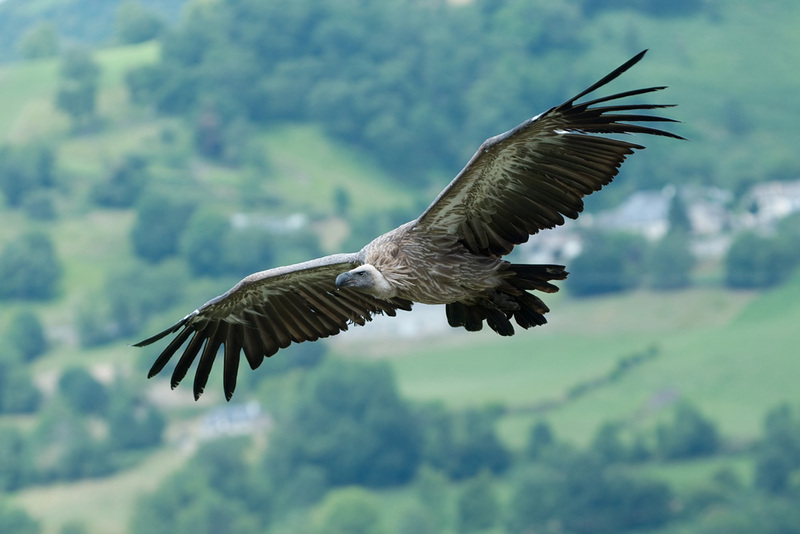 There are now over 1500 vultures in the French Pyrenees and the Cevennes. They are impressive. Stretch your arms out horizontally. Fingertip to fingertip is wingtip to wingtip for a young vulture. Fully grown, they are 50% bigger. Once, near Gourette, I saw a flock of them eating the remains of a sheep. As I warily approached they flew up, a black cloud circling above me. Feeling vulnerable, I only stayed long enough for a quick photo. On another occasion I was with a group of walkers lying in a field digesting lunch when a vulture dived at us. Before I had time to grab a camera it had swished by, a metre above our heads, and soared back into the sky having decided that we were not quite dead. This is the point. Vultures are officially carrion eaters. Their claws are not designed for attacking living prey. But there are now videos suggesting that they may attack living animals. The cow is clearly not capable of defending herself but she is not dead either. Some livestock farmers now consider vultures a menace. Has their behaviour changed, or were previous studies inadequate? Have they been watching Hitchcock? Perhaps it is a question of overpopulation, but nobody really knows. It is possible that rewilding may have unexpected consequences. 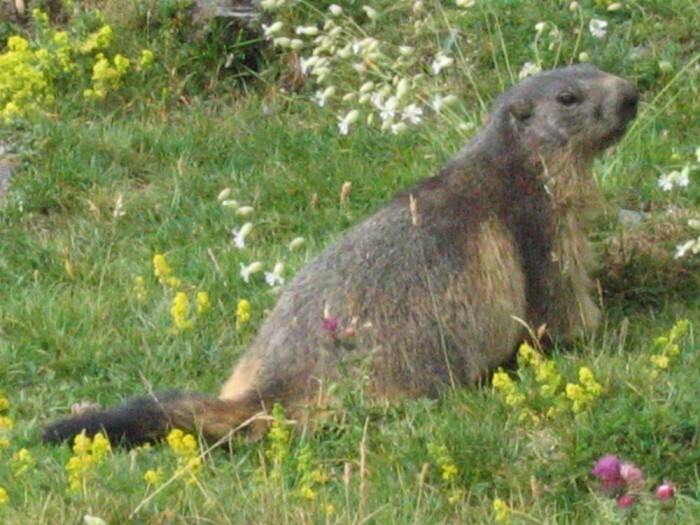 A day’s walking in the Pyrenees is not complete without the sound of a marmotte’s (groundhog’s) warning whistle. They quickly disappear into their burrows, only to poke their heads out a few minutes later. In the Ossoue valley above Gavarnie they are so tame that they will sit two metres away from the path as walkers pass by. It wasn’t always like this. Before 1948 you would have to go back thousands of years to find another marmotte colony in the Pyrenees though they never disappeared from the Alps. 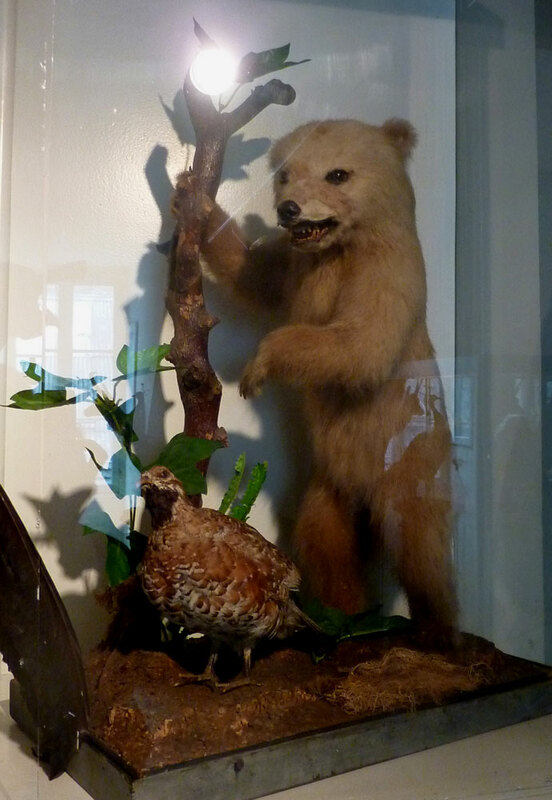 In the 19th century they were eaten – hibernating in their burrows, they were an easy source of winter protein. Their reintroduction to the Pyrenees was organised by a Dr Couturier who released six one-year-olds from the Alps without any kind of impact study. 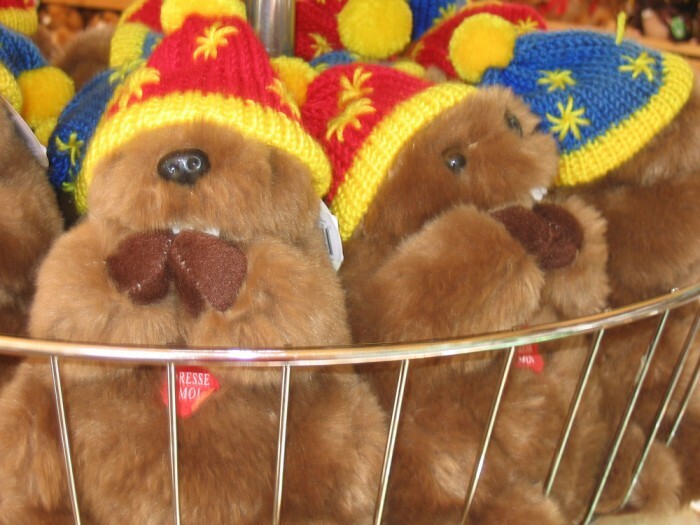 They are now everywhere, including in village shops where bobble-hatted examples whistle annoyingly at passing tourists. Marmottes are food for eagles and foxes; they are mostly vegetarian. As far as I know nobody has anything against them. Unsurprisingly given Monbiot’s visceral hatred of sheep, their wild counterpart, the mouflon is not on his list of possible reintroductions. I have only ever seen one at close quarters in the Pyrenees though I have come across small flocks in the Caroux (Massif Central). 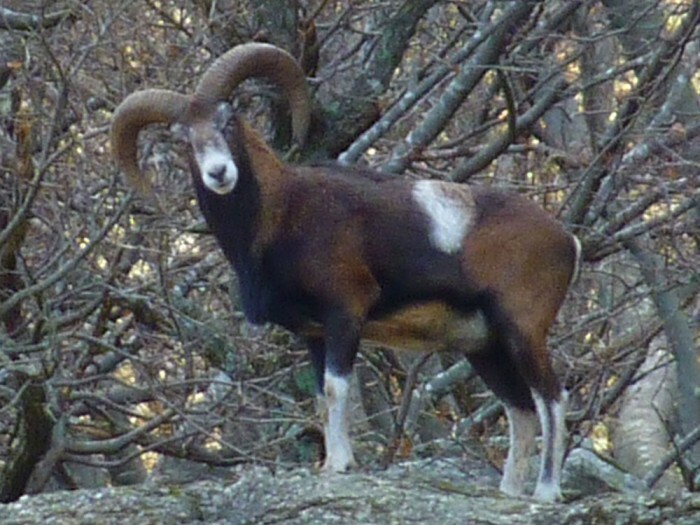 Mouflons were eradicated from the Pyrenees because they were thought to compete with sheep for pasture. They were first reintroduced in 1957. There are now about 800 in the Pyrenees-Orientales and 350 in the Ariège and a few more further west. They were reintroduced, not out of any concern for nature, but for hunting. It might seem a bit pathetic, hunting sheep, but the trophies are prized and the hunting is highly regulated. 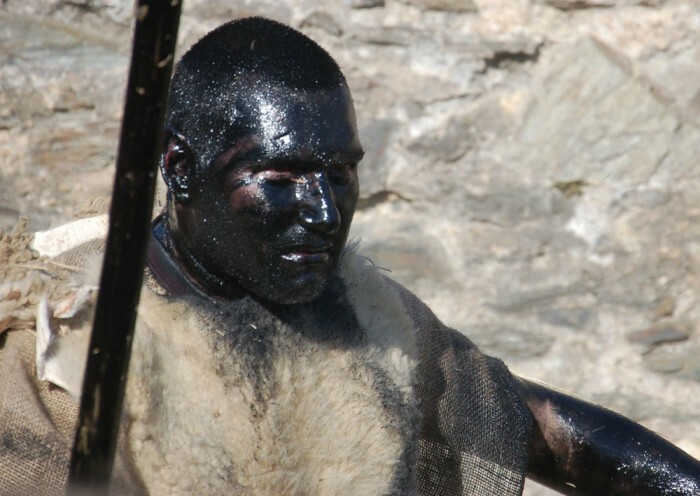 In 2009 a permit cost 600 euros and allowed one animal to be shot. 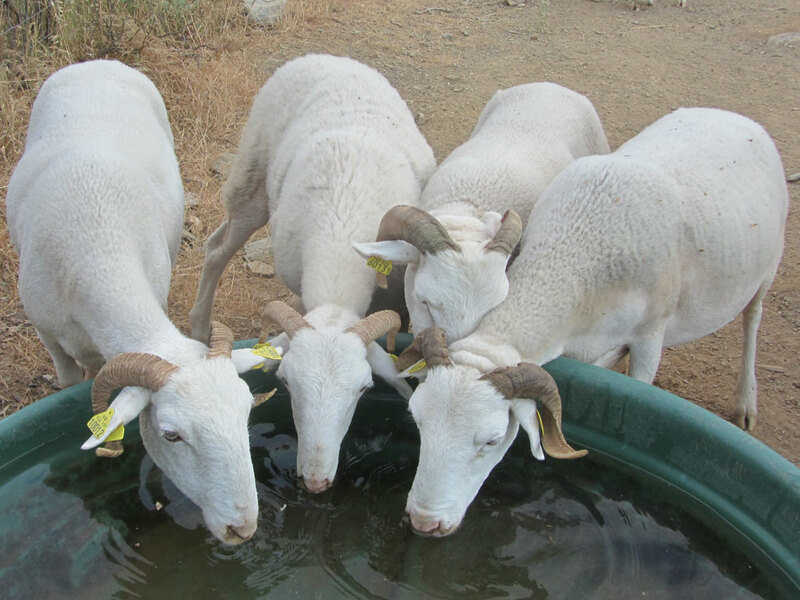 Priority is given to eliminating atypical examples – the offspring of cross-breeding with sheep. Paradoxically, it seems that the way to ensure the acceptance of a wild animal is to allow it to be killed by hunters! Despite the decline in numbers, sheep are not about to disappear from the Pyrenees in the immediate future. There are some 570,000 of them on the French side and a similar number in Spain. It is these sheep which have created the Pyrenees as we know them, just as they created the British uplands – with man’s help – by eliminating the conditions for forest regrowth. In the Pyrenees above the Bouillouses lake, pasture is being replaced by a carpet of purple rhododendron interspersed with yellow broom. Magnificent though it is, it is only a temporary flash of colour before the trees begin to recolonize. When sheep go, as happened in my village fifty years ago, the landscape changes quickly. The hillside on the other side of the river is now covered in an impenetrable tangle of self-seeded parasol pines. For Monbiot this is a tale of joy, but the long-retired shepherd in my village was saddened to see his family’s work, many generations of endeavour, slowly disappearing. So that when his daughter-in-law bought some Tarasconnais sheep, he was enthusiastic. Now, at least on this side of the valley the gorse is disappearing again and the garrigue is turning green. The tradition has not been lost, despite the fifty-year gap. Sheep are deeply ingrained in our culture – Christ is described as the Lamb of God, for example – and were one of the earliest animals to be domesticated, some 10,000 years ago. Yet Monbiot thinks they have less right to our consideration than elephants/mammoths which disappeared from Britain a very long time before that. He reasons that without sheep British uplands would rewild naturally. Rewilding is a ‘big idea’. Theoretically it has much potential. In a world where nature finds less and less space to express herself, what can we do to preserve the environment for future generations? Conservation merely slows down the process of naturbanisation (the urbanisation of natural space). Rewilding could reverse the process. But the devil is in the details and Monbiot is well aware that rewilding with dangerous animals needs to be consensual. His chapter entitled ‘How not to rewild’ shows what can go wrong when ideology dominates human thinking. On the Pyrenean Ark, the diverse animals have had remarkably different trajectories, no two alike; will it find land with all the animals still alive? This entry was posted on Sunday, June 8th, 2014 at 4:49 pm	and is filed under Uncategorized. You can follow any responses to this entry through the RSS 2.0 feed. You can leave a comment below, or trackback from your own site.